As you drive along the wild and beautiful coastline, what hits you first is the expanse and the lack of anything high rise. 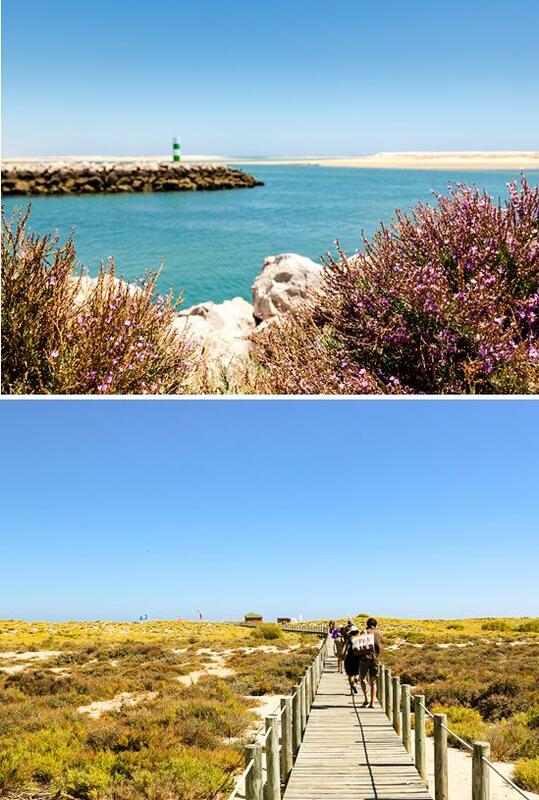 Here the marshes, salt pans and sand dunes of the Ria Formosa are a protected nature reserve. Long narrow sand bank islands stretch along most of the coastline, separating the mainland from the Atlantic, each with vast pristine white beaches and an air of nostalgia - families erecting their wind breaks, simple bat and ball games and cool boxes storing the day’s picnic. Some of the islands are connected to the mainland by bridges, others serviced by colourful ferries but on all, even in high season, you’ll find a strip of sand all to yourself. There are bustling fishing ports like Olhão. Packed with Moorish style multi-coloured tiled houses its centre is crumbling but has bags of character. Fishing has always been the area’s main livelihood and here you will discover its importance as the harbour becomes a frenzy of activity when the boats return with their daily catch. The town also has one of the best weekly food markets in the area and you will definitely leave ladened down with suit case friendly sweet almonds, dried figs and locally made rosemary honey. For somewhere more elegant, head to the ever so pretty riverside town of Tavira which straddles the River Gilão, the two sides linked by a Roman bridge. Here narrow lanes are filled with white washed buildings adorned with wrought iron balconies, colourful tiles and the distinctive Tavira pyramidal roofs. Churches are a big thing with nearly 40 towers and spires lending character to what many consider the most charming town in the whole of the Algarve. Food in the area is simple but delicious. Local tascas (cafés) heave with lively Portuguese chatter and serve up all you can eat barbecue charred fish, piri-piri chicken, black pork with clams, or in Santa Luzia - the octopus capital of the world - polvo served in every mind boggling way. In terms of where to lay your head, the western Algarve isn’t exactly overflowing with boutique hotels but here, in the rural east amidst carob, almond and pomegranate trees, you can find country houses renovated into stylish and relaxing boltholes where the owners work hard to ensure you experience an authentic Algarve. If you are thinking of heading to the Algarve any time soon, I urge you to go against the flow and, on exiting Faro Airport turn east, you really won’t be disappointed. For more information on discovering the delights of an alternative Algarve or for help on arranging any other trips then please get in touch.